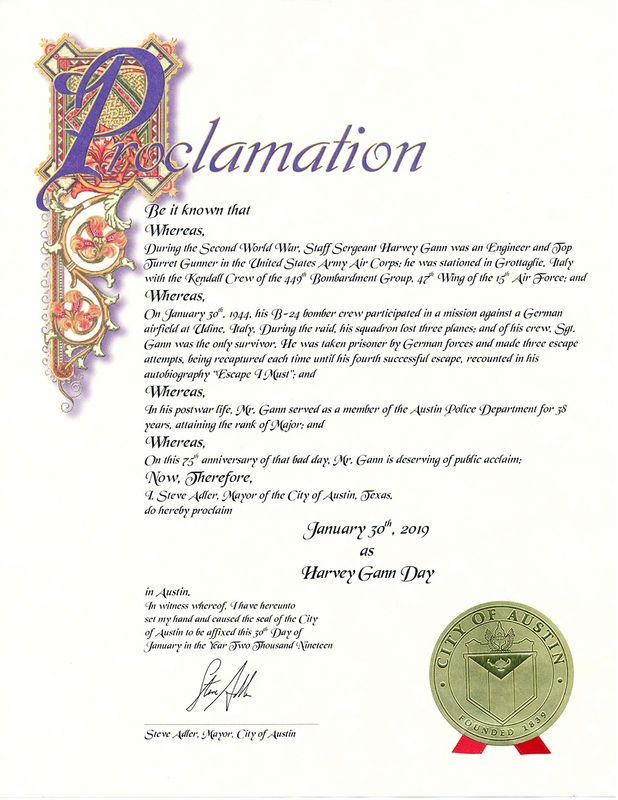 The 449th BGA (WWII) is pleased to announce that the Mayor of Austin Texas has issued a proclamation naming January 30, 2019 “Harvey Gann Day.” Harvey Gann was flight engineer and top turret gunner for the Kendall crew of the 449th Bomb Group, 718th Squadron. On January 30, 1944, his B-24 bomber with a crew of 10 participated in a bombing mission against a German airfield at Uldine, Italy. During this mission, his plane experienced extensive damage from intense flax and opposition from German fighters resulting in the plane going down in German-held territory. Harvey was the only survivor from the crew and was taken prisoner by German forces. He made three escape attempts and was recaptured each time until his fourth attempt which was successful. Congratulations to Harvey and a heartfelt thanks for your sacrifice and dedication in service to our Country.